The idea of forming teams of employees to assist in improving ergonomics is not new. In the U.S., guidelines provided by NIOSH and OSHA have promoted this concept for over 30 years. Also referred to as participatory ergonomics, the practice has been adopted by many employers. But there is no requirement that specifies creating an ergonomics team. So why form a team for ergonomics? 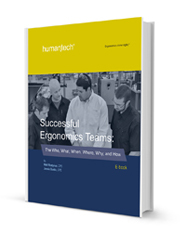 This e-book was created to share insight and best practices on when and how to leverage an ergonomics team. By sharing our experience and knowledge of these teams, we hope that you will be able to make informed decisions about establishing an ergonomics team for your organization, or to improve the management and operation of the team you currently have. The key to a successful ergonomics team is to have cross-representation of the various roles and capabilities within your organization. • the different training requirements needed for a comprehensive ergonomics improvement process. • the various roles and responsibilities that must be fulfilled. • the characteristics and makeup of a successful ergonomics team.